An article in the Vol. 6 No. 1 Texan News newspaper generated discussion online with comments such as “DON’T MESS WITH HISTORY!” and another comment calling to “Get Rid of” Stephenville’s Confederate monument. “The future of Stephenville’s Confederate monument” recieved over 3,000 views on texannews.net. Readers flocked to the comment sections on social media, and on the Texan News website. Texan News conducted an online survey to gather information about what voters think the city should do about the monument. 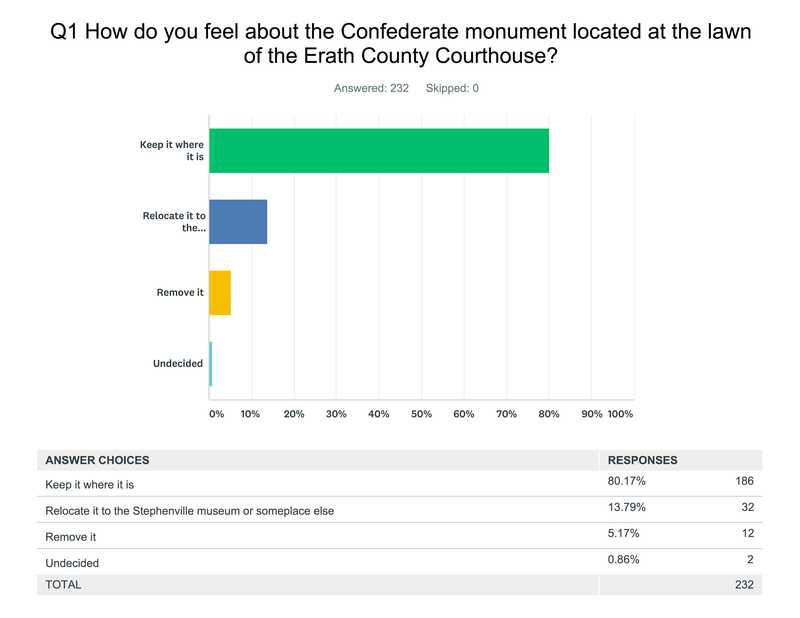 The comments online, and survey both show that most likely, the majority of Erath County residents believe Stephenville’s Confederate monument should stay put. 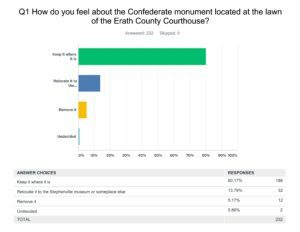 Of the 232 people who a responded to the survey, 186 said the monument should stay where it is. Thirty-two said the monument should be relocated to the Stephenville Museum or someplace else. Twelve said the monument should be removed. Two said they were undecided. The majority of those who voted in the survey voted to keep the monument where it is. Photo by Arynn Tomson. On texannews.net, one reader described Stephenville Mayor Kenny Weldon as “spineless” after Texan News quoted him saying any decision on what happens to the monument should be made by Stephenville residents. However, the most comments and some of the strongest reactions were on Facebook. The article was posted on the Texan News Facebook page, as well as Erath County Breaking News and The NEW Erath County Breaking News Facebook pages. On the Texan News Facebook page, Danny Pyburn commented twice on the article. On the Erath County Breaking News Facebook page, 149 users weighed in. In April, which is Confederate History Month for Texas, the Sons and Daughters of the Confederacy put Confederate flags at the graves of fallen Confederate soldiers in the West End Cemetery near campus. The West End Cemetery has also been at the center of controversy. In the 1920’s, the graves of African-American soldiers were relocated to the Mount Olive cemetery. In a 2013 Texan News article, Billy Chew, the supervisor of Stephenville’s cemeteries said that the decision was made because white soldiers did not want to be buried next black soldiers. But, others said Stephenville’s Confederate monument needs to be removed or relocated. Texan News has not yet been informed on any official decision regarding the monument, but will provide an update if an official decision is made. « Older Article Staff Editorial: Do the costs of construction outweigh the benefits? Good grief! This whole thing is part of AMERICAN history whether some of us like it or not! Hitler tried to destroy history. ISIS is doing it. Come on, we are better than that!!!! What people often forget is the majority of soldiers who fought in the war did not not fight for any certain set of beliefs. They fought for their community, their state , and their country in that order. Robert E. Lee said it best before the civil war I was a Virginian first and a citizen of the United States second. After the civil war I became a citizen of the United States first and a Virginian second. For many of us we get caught up in the circus that the media promotes that we only see bad news and look for the bad. What we often forget is all the good that has come from our country. Protection from unwanted search and seizure. These are just to list a few of many and our country continues to improve everyday. Their are many countries that have been established much longer then the United States and its 241 years of age. A list of other countries and their ages of establishment. I for one am proud to be an American first and foremost warts and all. Each day we build a better country not only for our own child but for the children of each other. Of course their will be growing pains but this great experiment that was started here in this fine country by the the poor the dissatisfied, the cast offs, the riff raft of other countries. Will continue to develop and make this country greater each day.